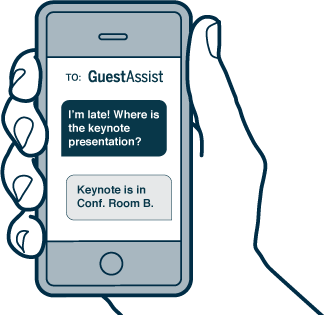 Empower your guests with GuestAssist Conference, a text message based communication system. Better the experience. Better your brand. "It was like magic! GuestAssist Conference made it a snap to make last minute schedule changes and notify hundreds of people instantly"
"Our members are not very tech savvy, but GuestAssist made it easy for staff and attendees alike. A must at our next meeting"
"We are very impressed with GuestAssist-Conference and the value that it delivers to event coordinators and staff."